Use this drill for a variety of different applications, including landscaping, soil sampling and fencing on rocky ground. Kickback is prevented with torque-free drilling! Digger features a powerful B&S Vanguard OHV engine with 10-inch pneumatic tires and 13:1 transmission. 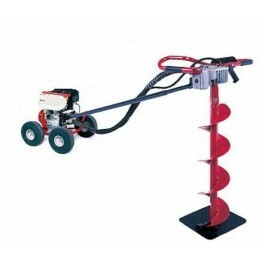 Auger not included. Ideal for drilling very rocky ground or clay, this post hole digger by Little Beaver has a medium-speed transmission of 13:1. 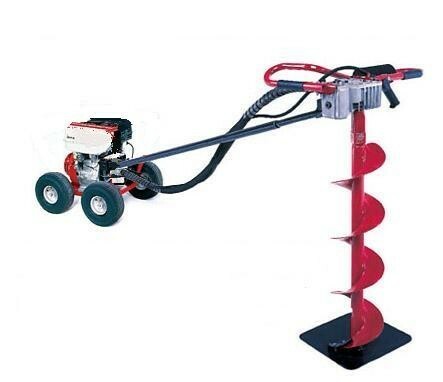 The perfect one-man hole digger, you can use this drill for a variety of different applications, including landscaping, soil sampling and fencing. Kickback is prevented with torque-free drilling! Post hole digger features a powerful B&S Vanguard OHV engine with 10-inch pneumatic tires and medium-speed 13:1 transmission. Auger not included.